On Valentine’s Day, MostlyFilm is here to show you that love can be strange, surprising and found where you least expect it. All romantic comedies are about unexpected love. Whether it’s the rich guy or the poor guy or the dead guy or the boy next door or the boy on the other side of the country, love is never where you expect to find it. And so it is with Crossing Delancey, a minor and often overlooked member of that rather strong run of rom-coms that ran from the second half of the 80s into the early 90s – let’s say Moonstruck to While You Were Sleeping, with When Harry Met Sally as its apotheosis. Crossing Delancey takes the familiar ingredients and gives them a gentle ethnic, in this case Jewish, twist. Isabelle Grossman (Amy Irving) is pretty content with her single life. Nice, rent-controlled Manhattan apartment and a fulfilling job organising literary readings for a venerable bookstore. Her parents have fled the city for Florida, but she makes regular visits to her Bubbie (Yiddish theatre star Reizl Boyzk in her only film role) who still lives in a small apartment on the Lower East Side, just off Delancey Street. Bubbie though despairs that, at 33, Izzy still hasn’t found a husband and so engages the services of a marriage broker to facilitate a meeting with Sam (Peter Reigert), a pickle merchant from the neighbourhood. Izzy is horrified, especially as she’s strongly attracted to Anton (Jeroen Krabbe), a pretentious European novelist, but finds herself playing along. You can guess the rest. There’s an indie-ish fuzziness to Crossing Delancey. It lacks the diamond-hard, machine tooled structure of When Harry Met Sally and its glossy, unreal vision of New York. Here the city is grimy and scuzzy and lived in, not everyone is white, or rich. Bubbie’s flat is small and plain and full of scrubbed Formica. The film is a little quirky. At times digressive and meandering, it’s populated with some odd minor characters, not all of them successfully realised. Some of the attempts at broad comedy – a self defence class for little old ladies, a cab driver who can’t drive – fall rather flat. But, much as Izzy discovers about Sam, it has moments of disarming and unexpected charm. Here’s one I think captures the film’s appeal. It’s Izzy’s birthday and she goes with a friend to a late night hot dog joint. The place is a bit of a dive, but busy and buzzy and mixed. 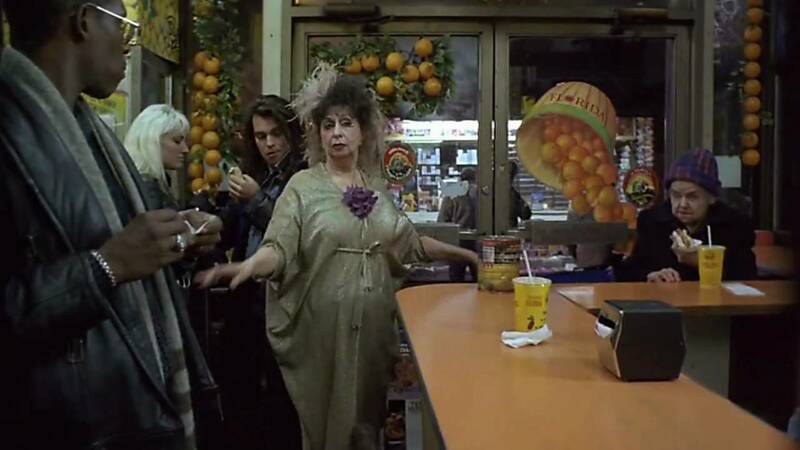 As Izzy’s stands at the counter, in comes a strange old lady, outlandishly dressed and dramatically made up, perhaps an old Broadway actress who has gone a bit mad – she wouldn’t look out of place in a David Lynch film. She starts to sing, Rodgers and Hammerstein’s Some Enchanted Evening, Once you have found him, never let him go. Once you have found him, neh-ver, let him GOOOOH. She sings it straight at Izzy. It starts unpromisingly, for all concerned. Within the first ten minutes, Taani endures the death of her fiancé on the morning of her wedding and her father giving up the ghost shortly thereafter – but not before he’s encouraged her to marry his favourite former student. Since deathbed guilt trips from Indian patriarchs are pretty brutal even by the standards of parental emotional blackmail, she agrees and is hitched in no time to the gentle, boring and thoroughly awkward Surinder who is no less surprised by the turn of events. They settle into a life which is wretched for them both. Taani sleeps alone and locks herself in her room all day, numb with grief in the ruins of her former self. Surinder tiptoes around her, wanting to speak and to reach her but embarrassed and inept and resigned to silence. They reach an isolated rhythm together which is only interrupted when Surinder’s boorish colleagues discover that he has secretly married. They insist on descending en masse to his house to celebrate and to see if it can really be true. As they gather, ready to point and laugh, Taani emerges from her room for the first time to greet their guests. She charms them, feeds them and plays every inch the elegant hostess of a triumphant party. Later, when the couple is alone again, she tells him, with regret, that she can never love him. He responds that he has never known, or expected, any true love. Her behaviour at the party, and allowing him to keep his dignity, is as much love as he could ever aspire towards and is enough to satisfy him. Things thereafter take the turn implied from the fact that Surinder is played by charisma-bomb megastar Shah Rukh Khan, massively and consciously against his normal screen persona: disguises, dance contests, hilarious golgappa eating scenes and a glitzily triumphant romance. It’s this moment, though, of initial connection through simple human empathy and kindness, which endures and which represents the true heart of the film. To the casual observer, Michael Mann’s Heat is a film about cops and robbers, bloodshed and guns, bank robberies and explosions. It is a film steeped in cold, hard machismo, filtered through the steely greys and blues of late 20th century Los Angeles. As such, it’s probably not everyone’s idea of a date movie. And yet Heat is shot through with devastatingly heartbreaking romantic moments, so much so it is hard to pick just one. Despite his assertion that “I’m alone, I am not lonely”, in Neil McCauley, Mann created a character whose aching loneliness emanates from him like some dark forcefield. It is written in his face, in his posture – tense, terse, self-contained, inscrutable, this is a man who has lived his life in a self-imposed solitary confinement. His is a loneliness which mirrors that of the city, a place where honest human connection is rare. Their courtship is hesitant, careful. These are two adults who know the dangers of letting your guard down, of removing your armour. Yet they do so. They open up to each other, put their fates in each other’s hands, they relinquish control. They fall in love. The scene which depicts this is wordless. There are no close-ups, no great declarations, no grand gestures. It is filmed from a distance, and we can barely see their faces. They are silhouettes, faraway figures in a scorched landscape. After finding out the truth about what McCauley does for a living, Eady runs from him, into the hills overlooking the glittering distant sodium lights of downtown LA, underneath a soft, burnt orange sunset. McCauley chases her, grabs her, pulls her down into the fronds of tall, dry reeds surrounding them. She submits – to him, to love. In a world full of criminals and violence, this is a moment of deep, grown-up romance. Aliens can be categorised as a sci-fi, action, horror, war, even a feminist film, but it’s not usually considered a romance. James Cameron’s 1986 follow-up to Ridley Scott’s 1979 Alien sees Ripley (Sigourney Weaver) return to the planet where John Hurt contracted a nasty bout of chest-ripper in the original. She accompanies a team of marines including Corporal Hicks (Michael Biehn) as they investigate what happened to a terraforming colony with which they have lost contact. In the midst of the ensuing carnage, confusion and gore, an unlikely relationship strikes up between Ripley and Hicks. He is initially won over by her forklift skills and later her ability to read a map without getting lost. 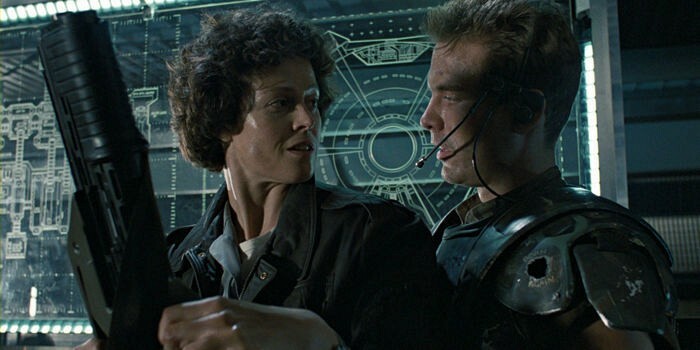 He is the only male who listens to Ripley, and this forms the basis of the connection between the pair. There is no physical intimacy on screen, but we assume that pillow talk would involve the reload procedure of an M41A pulse rifle and how some problems are best solved when nuked from orbit. It’s not the first time Cameron directed Biehn as the romantic interest opposite a strong female lead, they previously worked together on The Terminator with Linda Hamilton playig Sarah Connor. This time the enemy is a 7-foot acid-dribbling monster and not a 7 foot…um… (personally I wouldn’t fancy being pursued by either of them). There has been much talk about another film that sits chronologically after Aliens with Neill Blomkamp directing and with Weaver and Biehn returning. This is on hold for now, since there are Prometheus sequels in the pipeline. But if Fassbender’s head and Noomi Rapace can have their adventures in space, who are we to deny Ripley and Hicks happiness?